Distracted driving comes in many shapes and forms. Whether it's texting, eating, putting on makeup -- these activities take your eyes, hands, and attention off the road. '3 Seconds Behind the Wheel' is a new documentary released on Amazon Prime Video on April 1, the beginning of Distracted Driving Awareness Month. "Essentially, it says if there's something that doesn't relate to driving that you're doing while driving, and then is having an impact on your driving," Mesnard said in a phone interview with KGUN9. But it's not just what you're doing besides driving that would get you ticketed under SB 1141. To be at fault, Mesnard says you have to be posing a danger to others, such as weaving or drifting into other lanes. 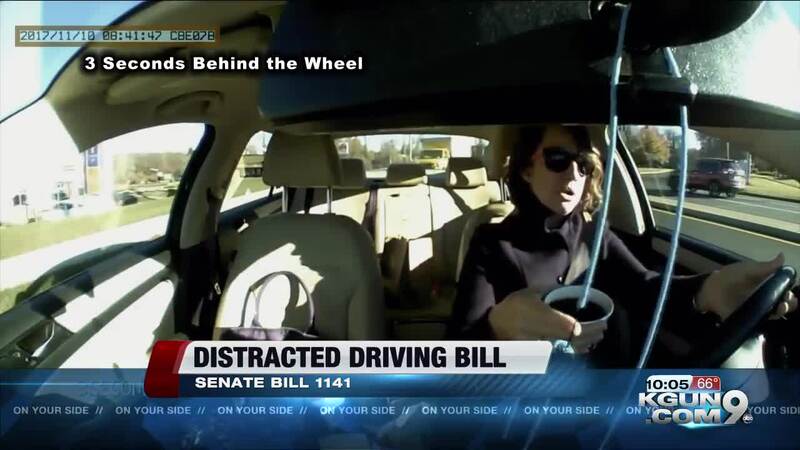 The bill also takes a broader approach to distracted driving beyond just restricting cellphone use behind the wheel. Senate Bill 1165 , sponsored by Sen. Kate Brophy McGee, is a statewide distracted driving ban that's up for a House vote. "Distracted driving existed long before the smartphone did," Mesnard said. "So whether it's putting on your makeup in the car, or dealing with other passengers that are in a car, all of those might be fine, so long as you aren't becoming a danger. And every person is different. Some people can handle doing a couple things at the same time while driving, others shouldn't even be talking to the person in their passenger seat." SB 1141 has passed the Senate and Committee in the House. Now, it's up for a vote in the House.